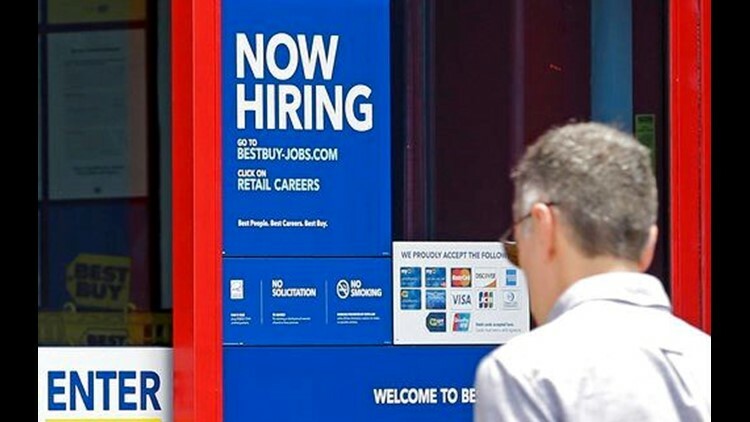 WASHINGTON (AP) — Hiring surged in June in a surprising show of U.S. economic vitality eight years into the recovery from the Great Recession. Pay gains remain weak, though, a stark reminder of one of the economy's key shortcomings. Employers added 222,000 jobs last month, and hiring in the previous two months was revised much higher. Job gains have now averaged nearly 180,000 a month this year, only slightly below last year's pace. Unemployment ticked up to 4.4 percent from 4.3 percent, but mostly for a good reason: More Americans started looking for work, a sign of confidence in the economy. Last month, economists worried that hiring would slow as employers struggled to fill jobs from a dwindling supply of unemployed workers. Friday's data suggests companies are still finding plenty of people to hire. That has given economists greater confidence the economy still has room to run. "This balanced pace should enable the current economic expansion to be maintained much beyond the historical norm," Russell Price, senior economist for Ameriprise Financial, said. The current expansion is the third-longest on record. So far, the job market and economy look broadly the same as they did last year, though President Donald Trump has boasted that his policies are accelerating hiring and growth. The economy's durability appears to be benefiting more people. The unemployment rate among blacks fell in June to its lowest level in 17 years, at 7.1 percent. The gap with whites, whose rate was 3.8 percent, persisted. The rate among Latinos dropped to 4.8 percent, the lowest in 11 years. Even with June's strong hiring, average hourly pay rose just 2.5 percent from a year earlier. The last time the unemployment rate was this low, wages were rising by roughly 4 percent. Normally, as the number of unemployed dwindles, employers raise pay to attract job seekers. Economists offer a number of explanations for why that dynamic hasn't yet kicked in. One factor: The influx of job seekers last month — who had previously been on the sidelines, not counted as unemployed — might have offset some upward wage pressures. Employers had more applicants to choose from. Mark Zandi, chief economist at Moody's Analytics, said many workers are too cautious to push for raises, partly because of the lingering effects of the Great Recession, when nearly 9 million people lost their jobs. And some businesses have decided they can't raise prices enough to afford meaningful pay raises. That cycle of limited wage gains and low prices has kept inflation in check. John McAuliffe, chief executive of Sylvan Learning, a company that offers tutoring to students from kindergarten through high school, is hiring more teachers and expanding. Yet it is cutting costs to maintain profits, rather than raising prices. The company has opened 10 new locations since March, creating about 100 jobs, mostly part-time. "More people have the ability to afford tutoring for their children," McAuliffe says. But the company sees little need to raise pay. "A lot of teachers look for supplemental income," he said. "We've always been able to find them." Economists forecast the economy will expand at roughly a 2 percent pace this year, about the same as it has grown since the recession ended. The economy appears resilient enough for the Federal Reserve to keep raising its benchmark interest rate. In a report to Congress on Friday, the Fed signaled its belief that the economy is on a firm footing. Many business owners are seeing greater confidence among their customers. Mark Dix, a general contractor in Knoxville, Tennessee, said he has seen a jump in demand for the renovation, painting and home construction services he provides. He employs 15 people. "I would hire another half-dozen people today if I could find the skilled labor," he said. Drug use is a problem among many people he considers for jobs, Dix said. And some men in the area rely on disability benefits, he added. The June jobs report showed broad hiring across numerous industries. Health care posted the biggest job gain — 59,100 — despite uncertainty around health care legislation in Congress.